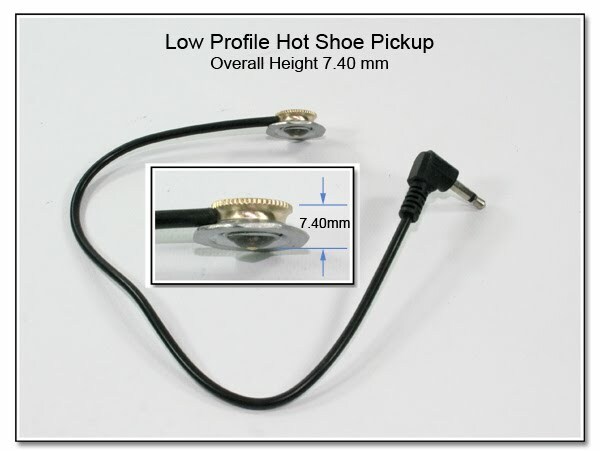 Several (additional cost) upgrade options are available for this Hot Shoe, such as using the larger and longer screws (Upgraded Hot Shoe), or using an oversized mini plug and rubber cord (Hot Shoe w/ Oversized Mini Plug and Rubber Cord), or using a coiled rubber cord of a custom length (Hot Shoe w/ Rubber Coiled Cord). 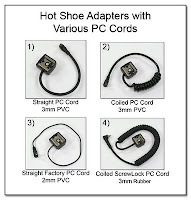 You can also have different PC connector cords coming from the hot shoe (Hot Shoes w/ Various PC Cords), whether they are coiled or straight, PVC or rubber, standard PC or ScrewLock PC. Update: There is no locking hole in this hot shoe, so the placement of your flash in the hot shoe must be determined manually to assure proper firing. Once you have determined the proper firing position, you should secure the flash in position with the lock mechanism of the flash. The SB-600 can be fired in the hot shoe, but it has a more finicky foot than most other flash units. In case there are not enough options to choose from already, this image shows the same Hot Shoe as above, but now it is a Hot Shoe with Oversized Molded Mini Plug - Rubber Cord and Upgraded Screws. 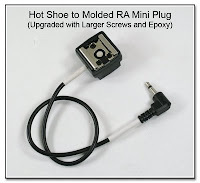 The Upgraded Screws add just $15 to the base Hot Shoe ($55, as above), and the Rubber Cord with the oversized RA Mini Plug (not the usual PVC) will add an additional $10 for a total of $80. The Upgraded Screws must be ordered if the Oversized Plug and Rubber Cord is ordered. The cord length can be custom sized up to 6 feet, and a straight oversized mini plug can be substituted if desired. This is the same Rubber Cord and Oversized RA Mini Plug that is used for the Pre-Trigger Cable - Cold Weather Versions, since the rubber tends to stay more flexible under a wider temperature range. 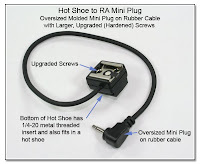 This Hot Shoe with Coiled Rubber Cord Ending in a RA Mini Plug is made with a custom length rubber (not PVC) coiled cord, upgraded hardened screws (to support the extra strain from the coil pull), and a RA Mini plug. The ends exit the coiled section axially for a very smooth extension and retraction of about a 3:1 ratio of the coiled section. This cord as shown will gently stretch to just over 10 inches, and fully retract repeatedly. This high quality cord is $90 as shown, in lengths up to a 6 inch coiled section (approximately 22 inches extended). The longest coiled section currently available is 14 inches, which will result in about a 6 foot extended length of cord for $100. Various other connector ends are available (just ask). Especially useful with the longer coiled cords is to use the Safety Clip, attached near the mini plug, which is an additional $5. Hot Shoes with Various PC Cords This image is an example of the different cords available to replace the thin (2mm) factory PC cord as seen in the lower left of the composite image. This unmodified cord is $40. The PC cord can be coiled or straight, and made from PVC, or the more flexible rubber, and have a standard PC plug, or the more secure ScrewLock PC plug. Replacing the thin cord with a straight PVC PC cord, and adding the larger upgraded screws as in the upper left would be $80. Upgrade this PVC cord to a coiled cord adds an additonal $10 for a total of $90. 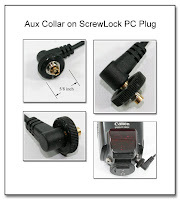 If you want the ScrewLock PC plug as opposed to the standard PC plug, it would be $90 with a straight cord. The ScrewLock PC plug is also available with the higher quality rubber cord for a total of $100 with a straight cord up to 10 inches long (not shown) or a coiled cord for $110. Connecting a Canon 580EX II to a SkyPort Receiver while the 580EX II is in Manual Master mode is now possible; it is just an additional $10 to add the electronics into this hot shoe (or a sync cord) and all will work just fine! The hot shoe (or sync cord) can still also be used in a conventional manner for other radios and other flash units without a problem. The image at left is the same hot shoe as above, but has the electronics so the SkyPort can indeed trigger the 580EX II in the Manual Master mode. 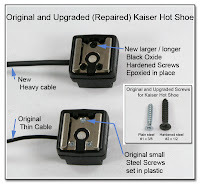 In addition, you can see that this hot shoe has been upgraded with the larger screws, as seen in the next image below. The white shrink tubing is in place as a way of identifying this hot shoe from one without the included electronics. 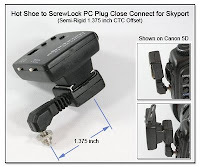 The Hot Shoe to ScrewLock PC Plug (Semi-Rigid) will easily support a SkyPort or MicroSync transmitter when it is locked into the PC jack of your camera. The hot shoe itself is offset from the PC jack by 1.375 inches so you will have clearance for your hand on the left side of the camera. This item is $80 and is usually used when a flash is in the camera hot shoe, and you prefer to not use a separate sync cord. Here you can see the Hot Shoe to ScrewLock PC Plug with Aux Collar to make it easy to grip and turn the locking ring of a ScrewLock PC plug. 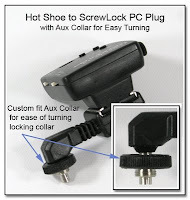 It is $20to add the Aux Collar onto the locking ring of a ScrewLock PC plug locking collar. These semi-rigid versions are being replaced with the more secure reinforced version as seen here. The Sonia Optical Slave Trigger is inexpensive at $20, but hasn't worked well with the Canon 580EX, 550EX, and 430EX flash units because of a lockup situation of the internal SCR, and Canon's quirkiness (the 580EX II does work correctly, though). This is now a thing of the past, as I have added the electronics to many cables and adapters to work around this problem! 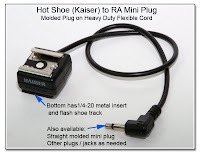 To add the electronics to any of the Kaiser hot shoes (like above) will add $35 to the cost of the hot shoe. (You will then also need an adapter to convert the mini plug to a PC plug for $15, if you don't have one already.) If you want to use a regular unmodified hot shoe to mini plug adapter you already have (or get here), then you just need my Special Mini Jack to PC Plug Cable which is $35 and shown in the image here of the Canon EX - Repeatedly Fired by Sonia Optical Trigger. 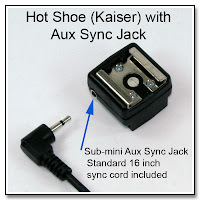 There are cables and adapters for those flash units that have the Aux Sync Jack Mod with the sub-mini jack, and even for those flash units where the mod has been done using the mini jack. Here is a link to the details, prices, and some of the current cables and connectors: Canon EX Flash - Reliable Optical Trigger Connections. 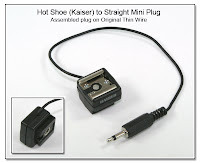 Hot Shoe with Attached Straight Mini Plug on Thin Wire: The same Hot Shoe as above is available leaving the existing thin wire in place, cutting off the PC plug, and then replacing the PC plug with a soldered on straight mini plug. This cord length is factory set at about 10 inches, and is on sale for $50. 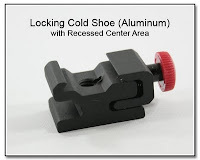 This hot shoe has both a bottom foot to fit into a shoe, and a 1/4-20 threaded insert (see inset). A very similar hot shoe that is factory glued (so you don't have to worry about screws) is also available and looks the same as in this picture for $45. This is shown in the bottom left of the composite image here. Mini Jack to PC Jack), shown also just below for $35 will convert the standard mini plug end to allow connection to a standard PC plug. Here is another view of the Low Profile Hot Shoe Pickup, and you can see that the overall height from the top surface of the brass cap to the bottom surface of the contact button is just 7.40 mm which is less than the 7.68 mm that is available under the Visoflex prism when used in the Leica setup. The other dimension that is critical in the Leica setup is seen in the next image below, and that is the overall height above the top surface of the camera hot shoe rails, which is shown as 3.41 mm. This dimension will vary somewhat depending on how tight the brass cap is screwed down, and the specific physical size of the individual hot shoe in question. 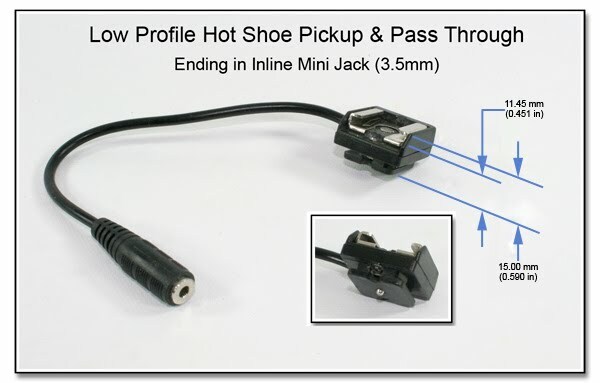 The end termination of this Low Profile Hot Shoe Pickup is shown as the standard mini plug (3.5mm), but naturally, just about any termination can be supplied for usually just a minimal additional cost. Often times, it is is preferable to keep the end termination as the mini plug, as that becomes an easy connection to radio transmitters or other devices and is one of the most reliable and readily available types of connections. 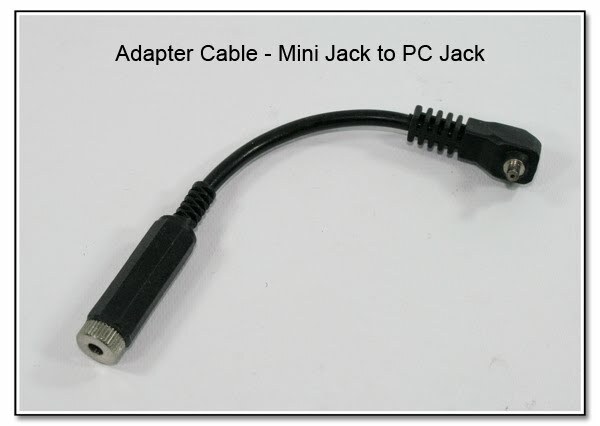 For compatibility to the older, but still often used PC connection, it is easy to use an adapter cable, such as the Mini Jack to PC Jack Adapter shown here ($35) as a way to connect the Low Profile Hot Shoe Pickup to the standard PC plug from many studio sync cords. 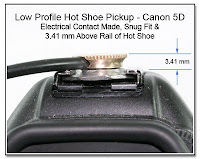 Another variation for the Low Profile Hot Shoe Pickup has the straight cable replaced with the coiled cable. This is $35 additional to the base price of $185. Here is yet another version of the Low Profile Hot Shoe Pickup. Ending in the Inline Mini Jack (3.5 mm), it allows for an easy connection to variety of custom and standard cables, such as the Reinforced Hot Shoe to Inline Mini Jack ($55), or the Metz 6 Row Flash Cable ($55). The Low Profile Hot Shoe Pickup is $185. This version of the Low Profile Hot Shoe Pickup w/ Pass Through is about half the overall size of a normal pass through device. 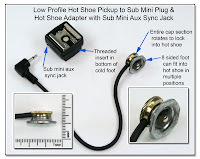 The Inline Mini Jack will allow an easy connection while still allowing a device to sit in the upper hot shoe, and get the same firing signal as being sent to the Mini Jack. 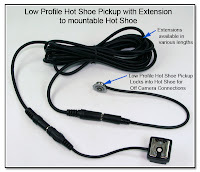 The Low Profile Hot Shoe Pickup w/ Pass Through is $175. Various plugs, jacks or other connectors can be used in this and any of the other sync cords on this site. 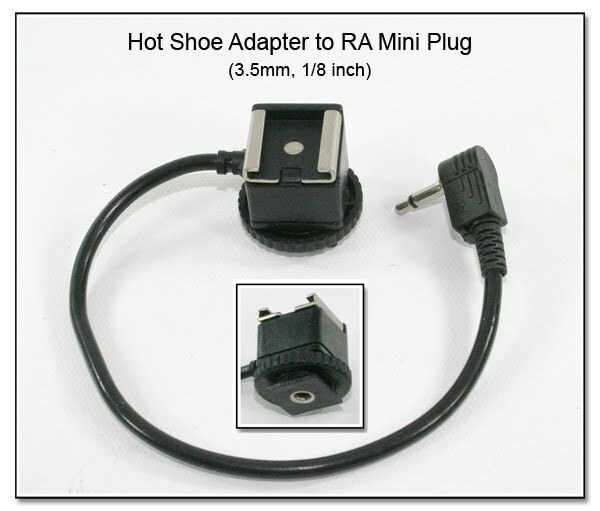 The Standard Weight 16 inch Sync Cord of a RA (right angle) sub-mini plug to a straight mini plug is included with this Hot Shoe with Aux Sync Jack for $145. Additional information on different sync cords and connectors can be found in the Sync Cord section, and in the section of the Plugs /Jacks / Cable / Hardware. 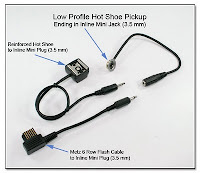 This image shows the Hot Shoe with a Molded Inline Mini Jack (instead of the mini plug as in the first picture) The modified Hot Shoe in this case is just $55, and extensions of up to 100 feet are avaliable. The Dual Linked Hot Shoes to RA Mini Plug is included with the Always Ready Dual Flash & PW Stand, but is also available as shown for $145. The cord lengths, and the connector can be customized as needed. These Hot Shoes can be upgraded with larger, stronger screws for $15 each, or $25 for the set, as in this link. 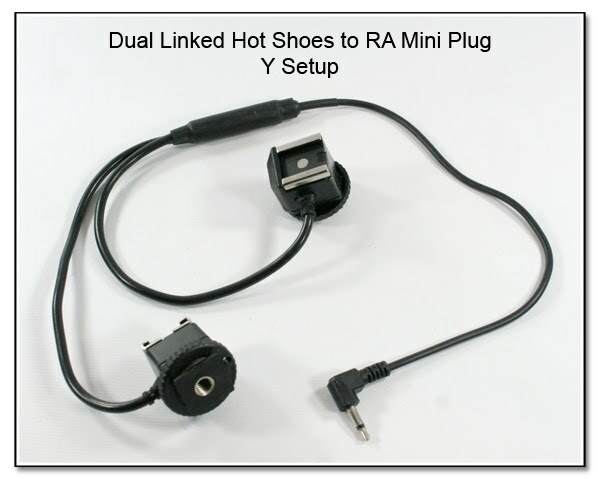 The Dual Linked Upgraded Hot Shoes with Rubber Coiled Cable ending in a ScrewLock PC Plug is $185 and will trigger the flash units in manual mode only, connecting to the camera PC jack through the very secure ScrewLock PC plug. The heavy duty rubber coiled cable will remain flexible in most temperatures. 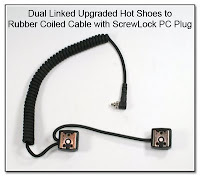 Making these Dual Linked Upgraded Hot Shoes with straight PVC cable, but still having the ScrewLock PC plug is $165, while using a standard PC plug would cost $145. Here is an example of the Dual Linked Hot Shoes Mounted to a 3rd party dual flash bracket. The PW (not included), and the Dual Linked Hot shoes are held in place with the Knurled ThumbScrew (seen in the inset). ThumbScrews are available in different lengths and head styles in the Hardware Section. The Hot Shoe to Mini Plug on a Thin Wire shown here is $30. The Coiled Sync Cable - 6 Foot is available for $35, and the OCC with the Aux Sync Jacks can have many different options which can be seen in the OCC section. The OCC-2 cord shown has the Aux Sync Jacks added to each end which is $130 in addition to the cost of the OCC. A new OCC-2 (while still available), is $60, which the OCC-3 (actually called the OC-E3) is currently $85.